A writer never stops learning. I always feel that I have so much more to learn about the skill, the art, the craft of writing, and reading widely is always a good way to prompt thinking, learning and improving. I’ve just read three books, each good in its own right, each very different. Ian McEwan’s Saturday was recommended to me by another writer I met in a networking situation. I’d read Enduring Love and Atonement so I added Saturday to my bookshelves. 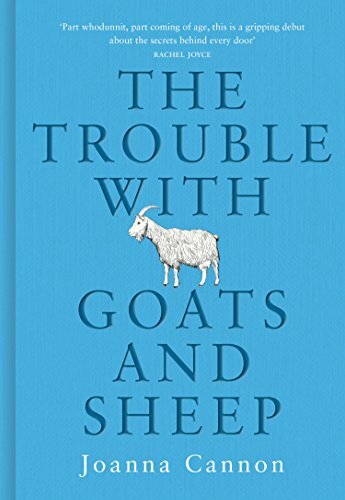 I also bought Joanna Cannon’s debut, The Trouble with Sheep and Goats. I know very little about the popular genre, Scandi Noir, so I also read Hannah Kent’s Burial Rites. All three books were clever, well written and , of course, as the old ingredient of subjectivity comes into play, I appreciated them all but loved only one. All three writers can put words together skilfully; they can create a character and tell a story, and each of them possesses a unique talent. The author’s voice becomes a voice inside our own head, we are reading the story and suddenly we are seeing it, believing it, living it. That’s a sign of a good writer. McEwan ‘s language is sinewy and taut and he doesn’t waste words. He strives to be astute and his characters are led by action, circumstance and background rather than emotion. His main protagonist, Henry Perowne, is a neurosurgeon and McEwan describes Henry’s skill with neuro operations in detail, his neat incisions, his efficient hands, his erudite diagnosis. McEwan could be describing his own writing, operating brilliantly with words, an accomplished practitioner. Henry and his lawyer wife Rosalind were not characters for whom I felt much empathy but I read and admired the book for all it’s assured poise and honed skill. Joanna Cannon’s novel, The Trouble with Sheep and Goats is a clever story which spans the summer heatwave of 1976. It is a coming of age story from the viewpoint of a ten year old girl but the prose moves smoothly from first to third person narration. The novel reminds me of so many others: Jeanette Winterson’s Why be happy when you could be normal? and Sarah Winman’s When God was a Rabbit. Cannon even echoes Harper Lee’s To Kill a Mockingbird with the central character of a growing girl learning about life amid prejudice, and the community’s harsh misunderstanding of Boo Radley is mirrored in the discrimination against Walter Bishop. However much I felt the novel was contrived or derivative, however much I didn’t really care about the central characters’ situations, I still enjoyed Cannon’s book, because she writes so engagingly. She pulls the reader in with humour and a wry smile. Even the chapters where the Kapoor family move into the estate and are received with well-meaning ethnocentricity, however predictable the situation, resonated as credible and I cheered at the put-downs, even though I saw them coming. Cannon moves skilfully between character, setting, time and I admired her book for it’s control and creativity. Hannah Kent’s Burial Rites is set in Iceland and the changes of weather and the bleak harshness of the landscape parallels the story of Agnes Magnusdottir, a prisoner awaiting execution for stabbing a man and burning a house. The story is told through Agnes’ ‘confession’ to a naive priest and also through a more objective third person narrative. Agnes is housed and made to work on a farm after her trial and we see her through the eyes of those who don’t doubt her guilt. It is a gripping story, in which information, action and background seep skilfully through each chapter and we are always in touch with the characters’ feelings. We grow to like the hardened Margret, we understand the complex Natan. Reverend Toti’s dilemmas and their effect upon his faith are completely credible and there is a little of Agnes in us all: we admire her wilful passion, her independent spirit, her strength and ability to survive and her internal monologue is always informative and loaded with impact. It is because I could visualise and empathise with the many complex characters that I liked this book the most. There is much to be learned from talented authors: the way they write, their choice of style and words, the way they evoke setting, character, action, time, is always fascinating and it is so helpful to analyse techniques used by popular authors. McEwan is a talented writer whose prose is effortless on the page. Cannon writes with wit, mischief and is entertaining while keeping her novel’s tension tightly bound. Hannah Kent’s Burial Rites is a page-turner: she has written a whirlwind of a novel which, for me, fuses character and action and tension in such a way that my imagination is illuminated like a technicolour screen. All three books are highly recommended. They are, each in their own way, complete and powerful. One is the work of a maestro conductor who has performed many times and can continue to perform with his eyes shut: one is a witty, smart solo debut which promises much more in the future; one is a memorable night at a rock concert which leaves the audience danced out, sweaty, sublimely happy and smiling for days to come.